Staff Sgt. 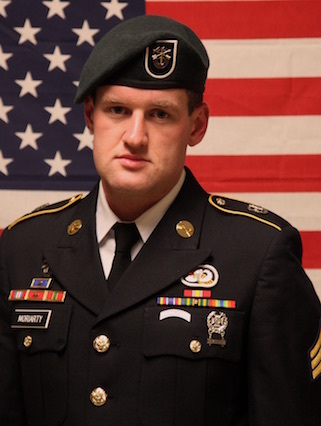 James F. Moriarty was born, Jan. 27, 1989 and was killed in action, Nov. 4, 2016, while supporting operations in Jordan. Prior to this deployment, he deployed three times to the Central Command Area of Responsibility in support of contingency operations. Moriarty was raised in Houston, Texas where he attended Annunciation Orthodox School and Strake Jesuit College Preparatory. He graduated from the University of Texas at Austin in 2011 with a Bachelor’s of the Arts in Economics. He was also a member of the Sigma Phi Epsilon fraternity. Moriarty enlisted in the U.S. Army on Sept. 13, 2011. He attended Special Forces Assessment and Selection in May 2012 and was selected to attend the Special Forces Qualification Course. He graduated in December 2013 as a Special Forces weapons sergeant. Upon graduation, he was assigned to 1st Battalion, 5th Special Forces Group (Airborne), Fort Campbell, Kentucky. Moriarty’s military schools include the Special Forces Diving Supervisor Course, the Combat Diver Qualification Course; Survival, Evasion, Resistance, and Escape Course; Advance Leader Course; Basic Leader Course; the Special Forces Sniper Course; the Joint Terminal Attack Controller Course; the Special Forces Advanced Urban Combat Course; and the Basic Airborne Course. Moriarty’s awards and decorations include the Army Good Conduct Medal, the National Defense Service Medal, the Global War on Terrorism Expeditionary Medal, the Global War on Terrorism Service Medal, the Non-Commissioned Officer Professional Development Ribbon (Numeral 2), the Army Service Ribbon, the Special Forces Tab, the Parachutist Badge, and the Special Operations Diving Supervisor Badge. Moriarty was posthumously awarded the Bronze Star Medal, the Purple Heart, the Defense Meritorious Service Medal, the Meritorious Service Medal, and the Combat Infantryman Badge.